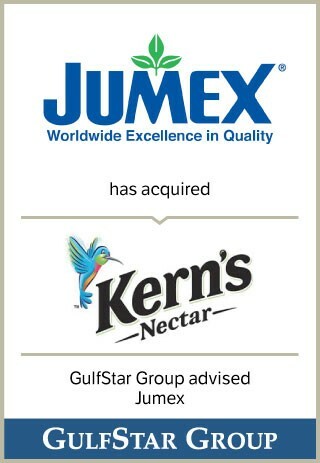 HOUSTON, September 26, 2013 — GulfStar Group (“GulfStar”) is pleased to announce the acquisition of Kern’s Beverages, LLC (“Kern’s”) by Jumex (or the “Company”). GulfStar served as exclusive financial advisor to Jumex throughout the transaction, which closed on September 26, 2013. Jumex is a leading international producer and distributor of juices and nectars known for the high quality of its products. Its portfolio comprises over 12 different beverage brands that afford health and wellness to consumers in more than 30 countries. This transaction successfully consolidated two of the leading brands in the Hispanic juice marketplace and provides Jumex with a well-recognized and well-respected American brand for meaningful portfolio expansion. Jumex intends to leverage the strong brand heritage and awareness Kern’s built over the last 90 years. The GulfStar transaction team included Managing Director Scott Winship, Associate Bobby Bryan and Analyst Kristie Ganss. GulfStar is a leading middle market investment and merchant bank headquartered in Houston. GulfStar specializes in providing merger and acquisition advisory services, institutional private placements of equity and debt, and general corporate finance advisory services to companies with revenues or enterprise values generally ranging from $25 million to $350 million. Since its formation in 1990, GulfStar has completed over 575 transactions in more than 30 states and seven foreign countries across a variety of industries. Through its merchant banking affiliate, the firm also makes equity and subordinated debt co-investments. For additional information please email swinship@gulfstargroup.com or call (713) 300-2011.